Many of the critiques of the latest Coen Brothers film, A Serious Man, began by comparing the struggles of protagonist Larry Gopnik (Michael Stuhlbarg), a college physics professor in the midwest, with those of Job. The New York Times' A.O. Scott, the Chicago Sun-Times' Roger Ebert, and the Washington Post's Anne Hornaday, among others, made reference to the Book of Job and poor Larry's varied predicaments: His wife is leaving him, a South Korean student named Clive is attempting to bribe him (and then threatens to sue Larry for defamation for pointing out that he is under an ethical obligation to report the bribe), and his world is just generally falling apart. If you've seen the film, read it all. If you intend to watch it, wait. 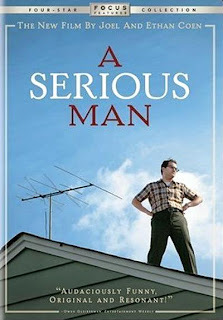 I share your appreciation for the Coen Brothers. I own all of their movies, save the Hudsucker Proxy and A Serious Man. I plan on adding both to my collection. My family watches DVDs for entertainment since we don’t have cable or satellite. Most of our movies are classics because they had a level of story telling and art that most films lack today, especially when it comes to dialog. The Coen Brothers, in my opinion, bring a lot of this back (of course there is a cost, especially with the language of films like The Big Lebowski—which happens to be the funniest movie of all time, and immensely quoatable). Speaking of quotable: A friend was at the Columbus airport on Friday flying back to Texas. He was asked by security what was in his laptop bag. He said, “Papers, various papers; business papers.” After texting me this I responded, “And what is your business, sir?” Pausing, as he leans back in his recliner, “I’m unemployed.” Classic. Thanks. I think the Coens did a superb job with True Grit. I wish they'd take on something like Huckleberry Finn. I enjoy reading Wittenberg Door, too. It's on my RSS feed.